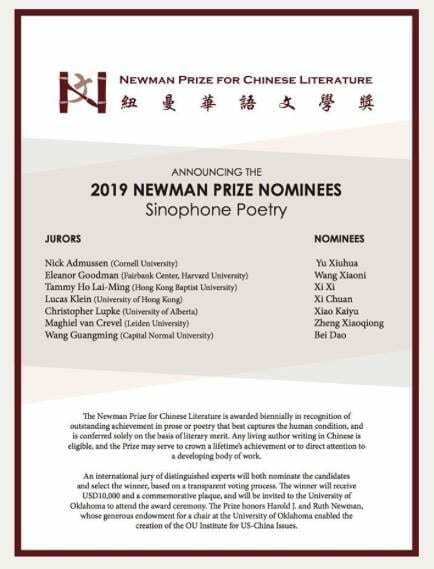 NORMAN, OK—An international jury has selected the Hong Kong poet Xi Xi 西西(born 1937) as the winner of the sixth Newman Prize for Chinese Literature. She is the third female Newman laureate, and the first from Hong Kong. Winner Xi Xi 西西(the pen name of Zhang Yan 張彥) will receive USD $10,000, a commemorative plaque, and a bronze medallion at an academic symposium and award banquet at the University of Oklahoma, Norman, on March 7–8, 2019. In addition to this year’s nominating juror, Tammy Lai-Ming Ho (Hong Kong Baptist University), other nominees and jurors include Yu Xiuhua 余秀华, nominated by Nick Admussen (Cornell University); Wang Xiaoni 王小妮, nominated by Eleanor Goodman (Fairbank Center, Harvard University); Xi Chuan 西川, nominated by Lucas Klein (University of Hong Kong); Xiao Kaiyu 萧开愚, nominated by Christopher Lupke (University of Alberta); Zheng Xiaoqiong 郑小琼, nominated by Maghiel van Crevel (Leiden University); and Bei Dao 北岛, nominated by Wang Guangming (Capital Normal University). the character of the city and its people. Her poems also demonstrate how stories of a city can be told through narratives that are at first glance insignificant, allegories and fairy tales instead of grand statements. Feminine, tender, witty, observant, and capable of tugging at the heartstrings, Xi Xi’s poetry reminds us Hong Kong poetry should not be ignored in any discussion. Previous winners of the Newman Prize have included mainland Chinese novelists Mo Yan 莫言, Han Shaogong 韩少功, and Wang Anyi 王安忆, who won the 2009, 2011, and 2017 Newman Prizes, respectively. Mo Yan went on to win the Nobel Prize in Literature in 2012. Taiwanese poets Yang Mu 楊牧and novelist and screenwriter Chu Tien-wen 朱天文won the Newman Prize for Chinese Literature in 2013 and 2015.